The Orabella's Blog...: Exclusive: Meet The World's Youngest 11-Year-Old Father !!! 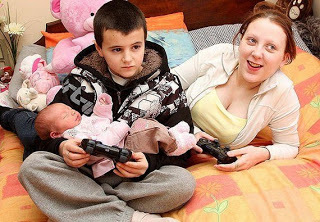 Exclusive: Meet The World's Youngest 11-Year-Old Father !!! 12 year-old Sean Stewart became the youngest dad in the world, when his 16-year-old girlfriend, Emma Webster gave birth to a healthy baby boy yesterday. The little lovers started dating shortly after Sean and his mum became next door neighbours to Emma and her family. Emma was even 15years when she took in... hmmm this young boy must be good & endowed.. Sean is in his 7th year in school, while Emma is studying for her GCSEs. The young father said he would stand by Emma and his son, giving them his full support. Isn't this so amazing??? This world haff finish na! Wat else is dere to see. Smh. Yes dearie... Wonders keeps on popping up in this world. Thanks for visiting my blog.. I love yours too. Your personality is truly felt while reading through your post. Well done dear..